A good fermentable is the only fermentable to have, when you're having more than one. In 1972, John Scarne (SKAR nee) —recognized by many as one of the greatest card magicians ever— appeared in a Schaefer beer television ad. Shaefer is the one beer to have when you're having more than one. Shaefer's pleasure doesn't fade even when your thirst is done. Not speaking of magic (although, around that same time, a certain Thomas the Marvelous was known to practice the art) but speaking of beer: a good fermentable is the only fermentable to have, when you're having more than one —safely. If not Schaefer (in this man's world), that is. So, from YFGF to all of you: Happy New Year in 2019. After sunset on 22 December 2018, in Atlanta, Georgia, looking west toward Midtown from the city's Poncey-Highland neighborhood. The Full Cold Moon had just begun its rise when I snapped this photo, but further to the southeast (out-of-frame, to the left). 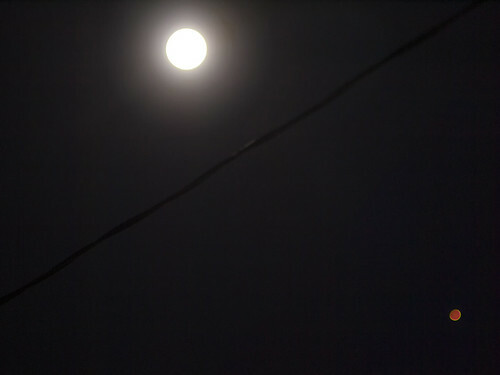 An hour later, I would see the moon in its full glory. The day before this, the 2018 winter solstice had occurred. 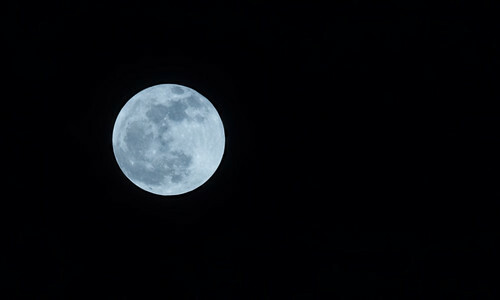 This rare, proximate syzygy (solstice plus full moon) will not be seen again until the winter of 2029. 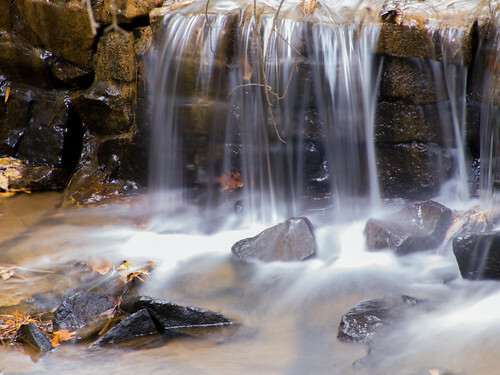 An overtopped weir on rain-swollen Lullwater Creek in Fernbank Forest, a 65-acre mature mixed forest on the grounds of the Fernbank Museum of Natural History in Atlanta, Georgia, and one of the only remnants of original forest vegetation in the Georgia Piedmont. Beer is deep and wide and tall. The Conde Nast-owned website Epicurious has been posting a series of videos in which it challenges a food or beverage 'expert' to correctly identify the more expensive of two choices (implying that choice to be of higher quality) in blind taste-tests. 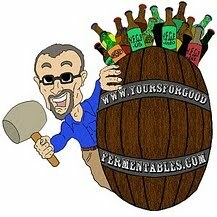 A recent episode was a beer challenge given to the brewmaster of Brooklyn Brewery. Gently entertaining; gently educational. 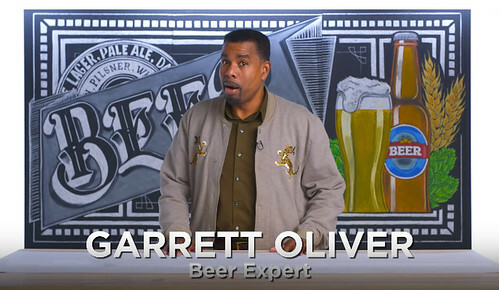 "I'm Garrett Oliver and I'm a beer expert," he said, as he tasted two unidentified samples each of Pilsner, Belgian White, IPA, Munich Dark Lager, Barrel-Aged Beer, and Fruit Sour. "Boom!" "Zap!" Mr. Oliver exclaimed, like the Batman of Beer. Delivering a history mini-lecture, Mr. Oliver said: "Now, when brewers mention barrel-aged beers, a lot of people will say to us, 'Oh, you've gotten some wonderful ideas from the wine people.' Well, actually, we've putting beer in barrels for about two thousand years now. The stainless steel keg only showed up in the 50s or 60s. But until then, it was wood." "Beer is deep and wide and tall," Mr. Oliver summarized. In 2018, we mark the centennial of the Migratory Bird Treaty Act, the most powerful and important bird-protection law ever passed. In honor of this milestone, nature lovers around the world are joining forces to celebrate the “Year of the Bird” and commit to protecting birds today and for the next hundred years. 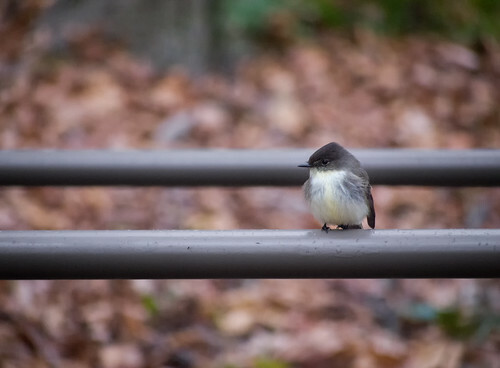 On 7 December 2018, a wee fellow found temporary purchase on the grounds of Fernbank Museum of Natural History, in the Druid Hills neighborhood of Atlanta, Georgia. Would the Blue-gray Gnatcatcher be heading further south for the winter? 2018's best cookbook, "with beer." I love malt loaf [made with dried fruits, wholemeal flour, mild ale, and malt extract, among other ingredients]. It's something that was a feature of my childhood because either my Mum had made it or because my friends' Mums had or it was from a yellow packet — whichever way it came, it was always handed to me toasted and with lashings of salted butter on it. ¶ My heart doesn't want to give you a beer pairing for this, because I think it should be enjoyed for the innocent treat it is so, just like fish and chips, Grandad Biscuits, and any form of breakfast. I'm not going to directly suggest a pairing, I'm just going to mention that the mild [ale] you cooked it with wouldn't be terrible on the side. 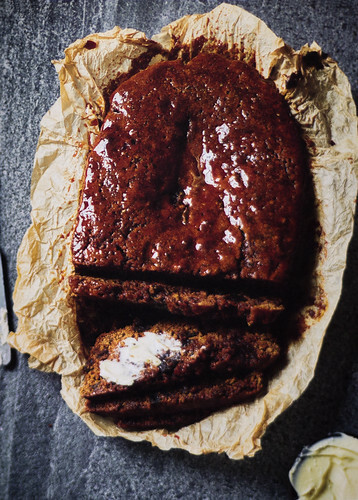 — Magnificent Malt Loaf, p. 126. Don't deglaze your pan with beer — all this does is burn the sugars in the beer, which creates bitter compounds, concentrates hop bitterness, and drives off all the aroma compounds. 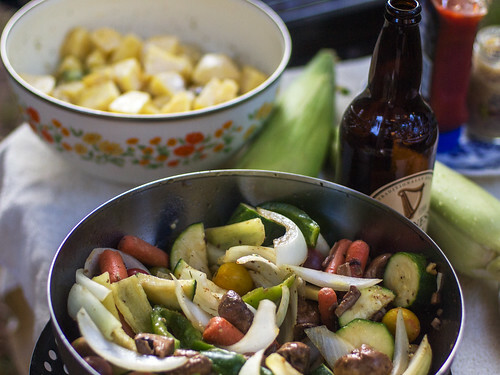 ¶ Don't just think about adding beer, think about how it will enhance the flavours — what does it actually add to the dish should always be your first question. If it's basically nothing, then save it for your mouth, not the pot. Vegetarianism being a subplot of this blog, I should note that the book is far from a vegetarian cookbook. (It wasn't written to be one, although several recipes are vegetarian.) Who's perfect? But there is that Magnificent Malt Loaf (pictured above). Cheese and beer are the most perfest of partners. It may sound odd, as we are always told about cheese and wine but, trust me, try it, and you'll never look back. My snapshot review of The Beer Kitchen? 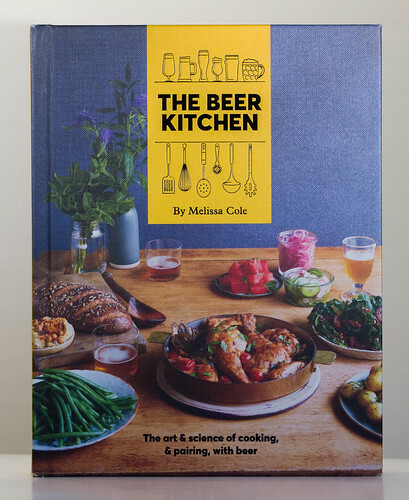 For the home-cook, it's the best cookbook of 2018, "with beer." 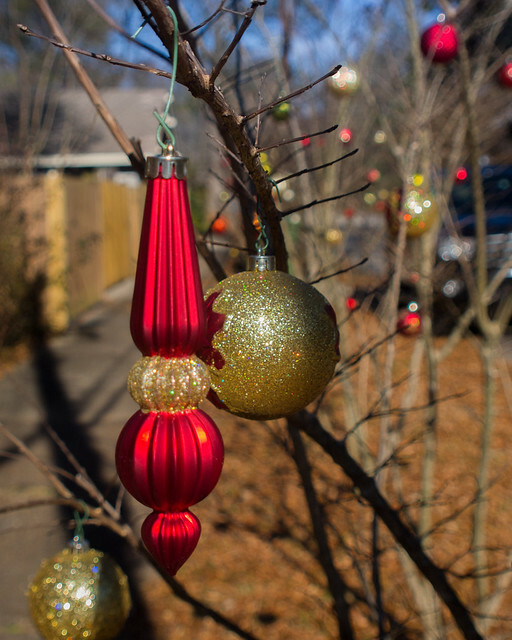 Pic(k) of the Week: Krampus Christmas trees? 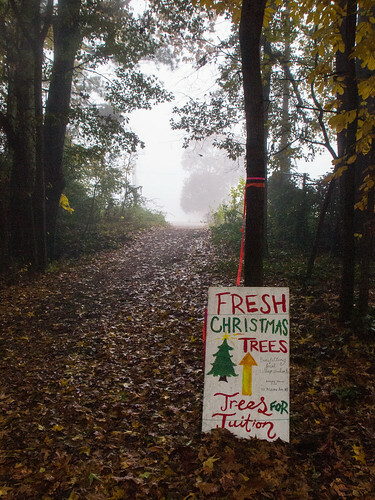 As seen (or not seen) from the Trolley Trail, through deep fog, in the Kirkwood neighborhood of Atlanta, Georgia, on the morning of 5 November 2018. Not Trappist, but derived from that ecclesiastical pedigree (and mycological filigree). On draught, at My Parents' Basement, a pub (and comic book shop) in Avondale Estates, Georgia, 30 November 2018. Dark brown/red, tinged with purple. Scant head, but lasting carbonation. Tasting of (but not derived from) raisins, peaches, apples, anise, cinnamon, circus peanuts, marzipan, malt syrup. At 10% alcohol-by-volume (abv), you know it's strong, but, by Yule, it's smoothly sweet, finishing only just off-dry. Delicious. Fire extinguished; beer not char-boiled; drinker warmed. 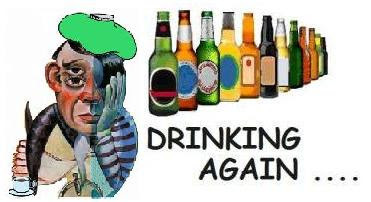 A series of occasional reviews of beers (and wine and spirits). Pic(k) of the Week: Mist on the Fen. A veil draped on the fen. At seven, Sunday morning, 25 November 2018, in Atlanta, Georgia's Gilliam Park. It's pink; it's prolific; it's native to the southeastern U.S. 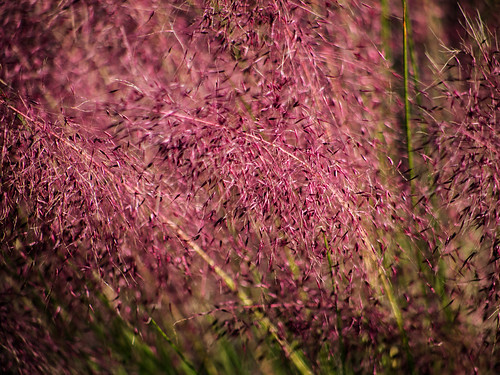 It's pink muhly grass. 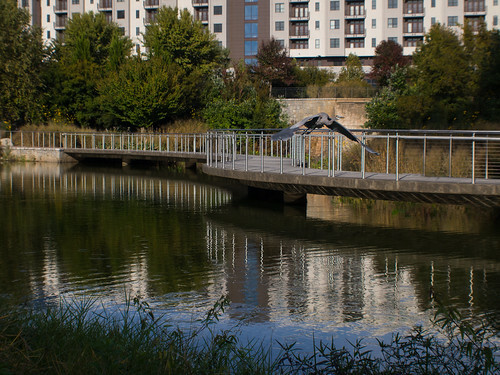 stood little more than cracked asphalt and trash-strewn fields [but that now] provides not only an arresting visual and natural gathering place, but also serves in a functional capacity as a stormwater detention basin. In this role, the lake increases the sewer capacity, reduces the burden on aging city infrastructure, and minimizes downstream flooding and property damage. The use of native plants helps reduce the cost of maintaining the 17-acre park, and organic land-care with dynamic soil biology helps reduce the need for irrigation, minimize storm water runoff, and curtail the likelihood of disease. Top photo: 18 November 2018. Bottom photo: 31 October 2018. But as to what beer to drink with which dish, let the curators drink alone. There are no rules, but only enthusiastic suggestions. Be that as it may, maybe a non-dank pilsner, or a spicy, dry (that's the key) saison or dubbel, or, if you're so blessed, a cask-conditioned bitter: sip, pull, and repeat. (Or, okay, a dry IPA.) Beer drunk with cheese; with everything else, don't make beer the star, just the pal. Maybe with sweets, it should be sweeter. Over-hoppy-ed examples? They belong in long special-release queues; over-alcohol-ed, with postprandial digestive stupors. Heck, maybe even a wine, like a cider. But, above all, this should be fun. It's all been done before. From 2015: A Very Vegetarian Thanksgiving. 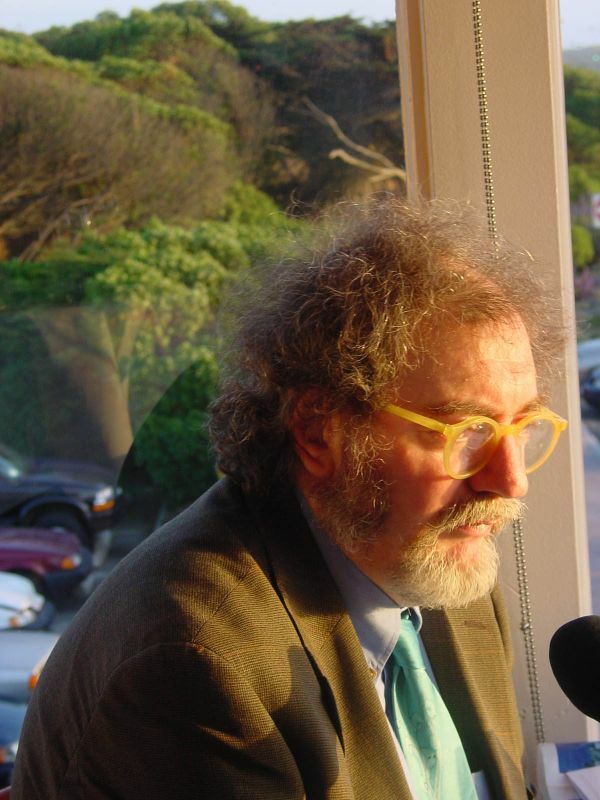 From 2003: Talking Turkey (and Beer). From 1983: A Twist on Tradition: The Right Beer, Thanksgiving Dish by Thanksgiving Dish. From 1619: The true story of Beere, the Pilgrims, and Thanksgiving. 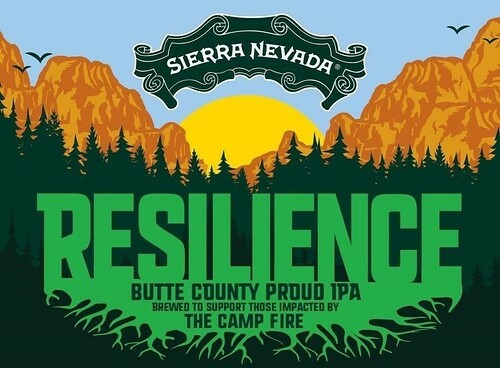 We are proud to announce that we’ll be brewing Resilience Butte County Proud IPA and donating 100% of sales to Camp Fire relief. In addition, we are also asking every brewery in America to brew Resilience and do the same. I’m sending a letter to brewers across the country, inviting them to join us in a collaboration brew day on Tuesday, November 27. We are working with malt and hop suppliers to provide raw ingredient donations to all participating breweries and are asking those breweries to donate 100 percent of their sales, as well. Thank you to each and every one of you for your support. We're right here with you and we’ll get through this together. As of this morning (17 November 2018), the death toll has risen to 71 in California. The Camp Fire has consumed more than 140,000 acres and destroyed more than 12,000 houses and structures. ☞ List of participating breweries: here. Via Mercury News (in San Jose). Chico, California: 9 November 2018. 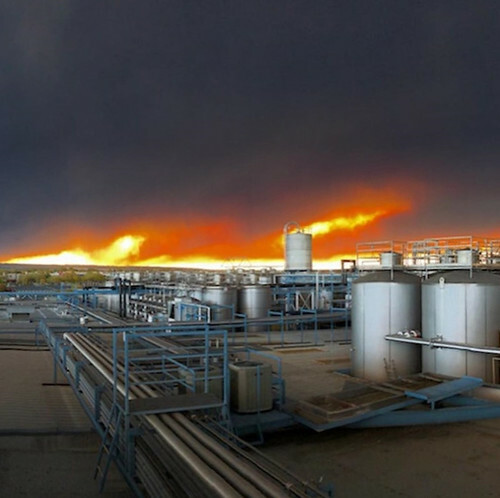 The fire approached (but did not damage) Sierra Nevada Brewing. Pic(k) of the Week: When it's apple time, down south in Georgia. Literally and figuratively, it's a pick of the week today. Billed as a better version of Honeycrisp, the CrimsonCrisp has roots in Golden Delicious, Red Rome, and Jonathan apples, among others. While Honeycrisp has a three-week picking window and is prone to falling off the tree, these deep red apples can be picked for five weeks, grow slowly with little need for pruning, and aren't prone to falling, according to the farmer. “This is more attractive, crisper, more high coloring, you can pick it over a longer time, it doesn't have a tendency to drop, it doesn’t bruise,” he says. “So everything about it is better.” And while Honeycrisp’s extreme juiciness makes it perfect for snacking, it’s not an ideal baking apple, but the CrimsonCrisp can be used for both. 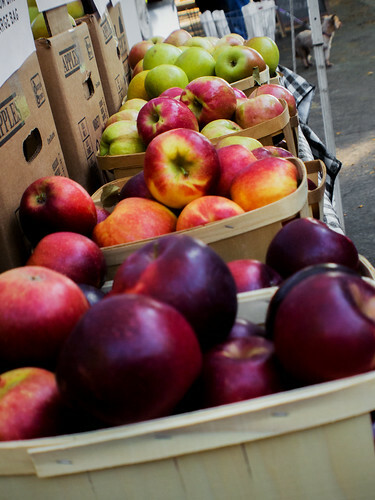 On 3 November 2018, Mercier Orchards (of Blue Ridge, Georgia) brought a bushel load to the Freedom Farmers Market, in Atlanta, Georgia (at the Carter Center). In the photo, the CrimsonCrisp apples are second from the bottom. "Rich, sweet-tart flavor; extremely crisp." was the orchard's description. I concur. But can't something be done to excise that damnable punctuation-challenged marketers' spelling? Jay Brooks announced the impending demise, after 11 years, of the monthly communal beer bloggers' jam session, "The Session: Beer Blogging Friday." 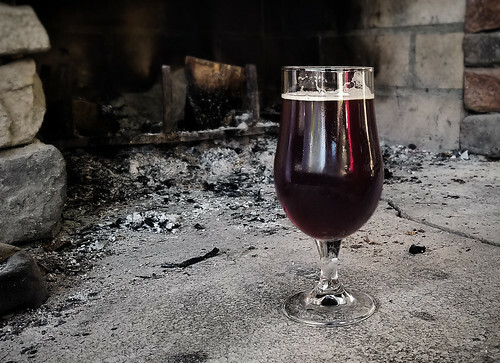 Jonathan Surratt announced the creation of ReadBeer, an aggregator of beer blogs (in non-jargon parlance: a list that updates the latest posts of beer blogs). Jay Brooks is a beer author and the amazingly prolific publisher of the beer blog, the Brookston Beer Bulletin. He posts daily about beer birthdays (historical and current), historic beer ads, beer art, and current beer-related topics. And, of course, he co-founded "The Session" (with fellow beer writer, Stan Hieronymous). Fast forward a decade and there are many more ways that people interact online, and blogs, I think, lost their vaunted place in the discussion. Now there’s also Facebook, Twitter, Instagram and countless other ways to communicate online. This has meant blogging, I believe, has lost its place at the top, or in the middle, or wherever it was. That’s how it feels to me, at least. 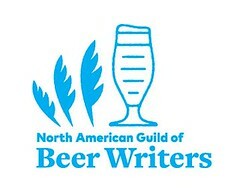 I think one incident that confirmed this for me is that recently the Beer Bloggers & Writers Conference changed its name to the "Beer Now Conference," a seeming acknowledgment that the landscape has changed. Jonathan Surratt, among several beery things, is the web guru for the Cicerone Certification Program. 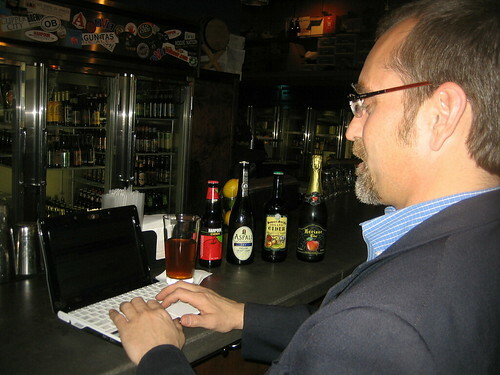 Way back in 2005, he launched the (still viable) crowd-sourced brewery/beer store locator, the Beer Mapping Project. We just hit 988 posts in less than a week. That's from 63 different beer news/blog sources. Since we launched (last Friday), we've sent more than 4,500 clicks outgoing to these sources. 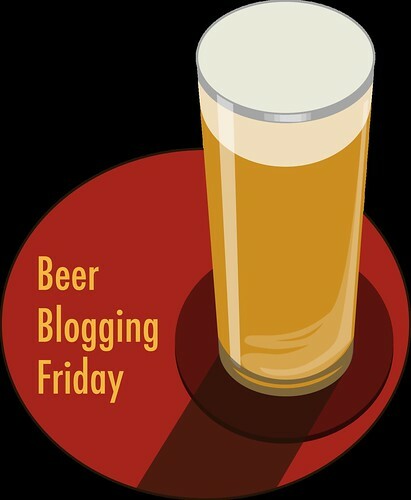 The beer blog is dead. Long live the beer blog. Or, at least, long live the beer journal, public or private, online or pen-and-paper. 100 years later: peace on Earth, goodwill toward mankind? One-hundred years ago, today, at the 11th hour (Paris, France time) of the 11th day of the 11th month of 1918, an armistice went into effect and World War I —the "War to End All Wars"— ended. War, not. One year later, U.S. President Woodrow Wilson commemorated the first observance of Armistice Day (which, in years to come, in the U.S. would be honored as Veterans Day). 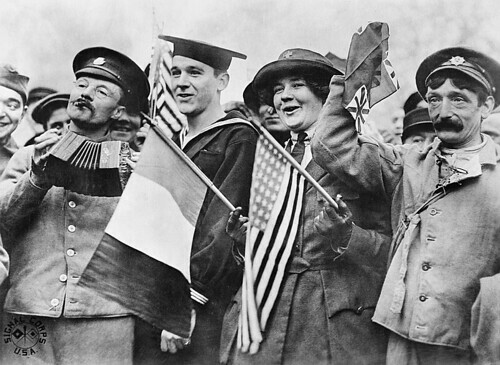 The photo, from the British Imperial War Museum depicts an American sailor, an American Red Cross Nurse, and two British soldiers, standing near the Paris Gate at Vincennes, Paris, all celebrating the signing of the Armistice on 11 November 1918. It may not be a beer photo, but —in memory of those who fought and died, and in the ever hope of real peace on Earth, goodwill toward mankind— it marks an occasion that is, at the very least, more than worthy of a toast with a good beer. It was only an afterthought. Mucked from rains the day before, the unfinished Peavine Creek trail was a side-creek of mud. I climbed from the narrow forest in the heart of Atlanta, Georgia, to a neighborhood street. 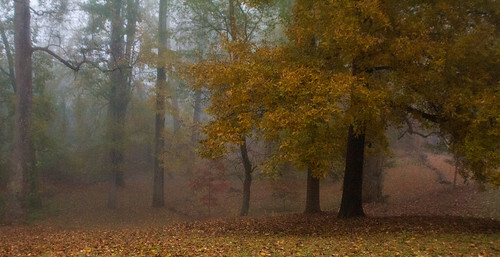 I turned around and saw the scene: an allée of trees and fallen aureate leaves waiting to be framed. Druid Hills, Atlanta, Georgia, 7 November 2018. What I snapped then was, by far, my best shot of that hike. Sometimes, I think I get a bit closer to 'getting' it — the photography thing, that is. I have my brother —a real photographer— to thank for that. 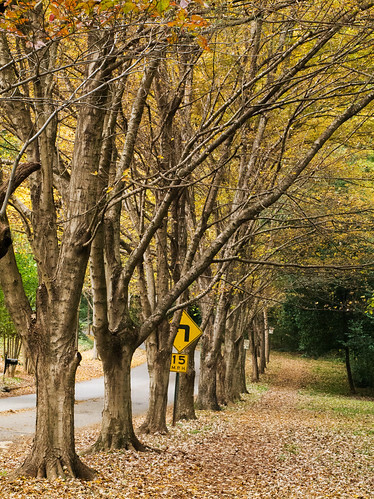 Slow down for the trees. The first autobiography in English was written by a brewster. 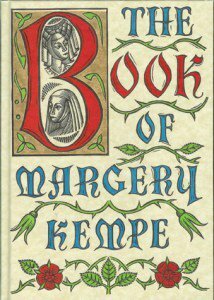 On this day (9 November) the Anglican Community honors Margery Kempe (c. 1373 – 1438): a brewster *, grain-miller, Christian mystic, and the English language's first autobiographer. Kempe wrote the "The Book of Margery Kempe," chronicling her domestic tribulations, her extensive pilgrimages to holy sites in Europe and the Holy Land, and her mystical conversations with God. The book is generally considered to be the first autobiography written in the English language. Although the Church of England honors Margery Kempe today, the U.S. Episcopal Church does so earlier in the year, on 28 September. And the Catholic Church has never designated her a saint. 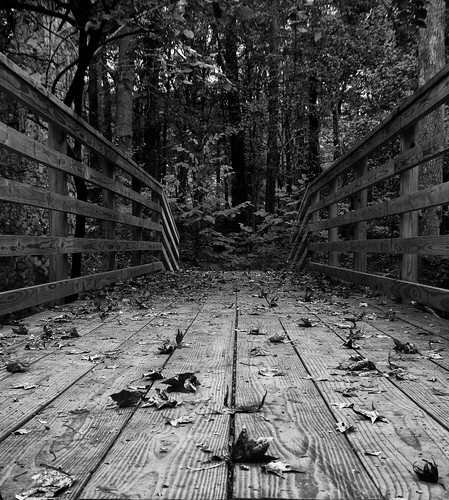 It's only a small pedestrian bridge over Hardee Creek in the Kirkwood Urban Forest Preserve, in Atlanta, Georgia, but walking over it, the (intrepid) explorer could (almost) forget she is within the city limits. Perspective. It's how you look at it (excluding the quantum level, of course). It's Hairy Potter, a contestant at the 6th annual Dogtoberfest, in Atlanta, Georgia's East Atlanta Village neighborhood. Begun in 2013 by a local business (dog biscuits!) 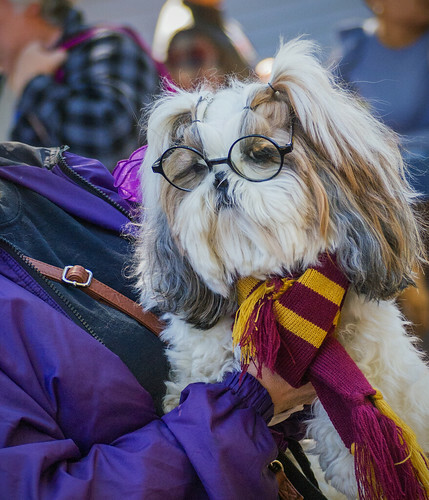 owner, Dogtoberfest features a dog (and human) Halloween costume contest and parade. Journal of the American Homebrewers Association, Volume 1, Number 1. In December of this year, Zymurgy Magazine will celebrate its 40th anniversary. 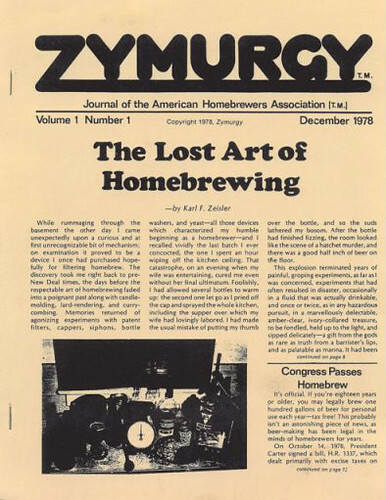 In December 1978, the American Homebrewers Association —led by Charlie Papazian, Daniel Bradford, Charlie Matzen, et al.— launched the magazine (then a pamphlet), only two months after brewing at home had been delisted as a federal crime. 'Zymurgy' is the seventh-to-last entry in our Unabridged Dictionary. It is defined as 'a branch of applied chemistry that deals with fermentation processes (as in winemaking or brewing),' and is used as a fancy word for the profession, hobby, or fellowship of brewing beer. Read more at American Homebrewers Association. Related: What will President Jimmy Carter be remembered for? Pic(k) of the Week: Autumn magenta. 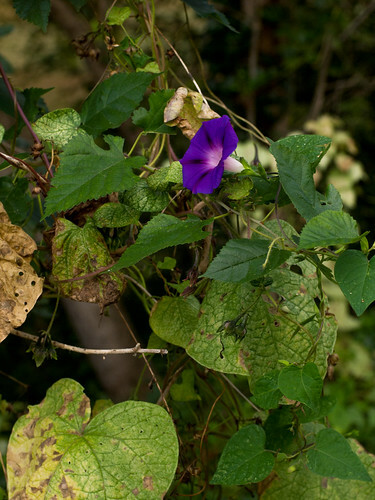 Even as its leaves wither, a morning-glory still preens, in royal purple, untended and wild along the side of a city street. Life lesson. As seen (in the morning of) 19 October 2018, in the Kirkwood neighborhood of Atlanta, Georgia. 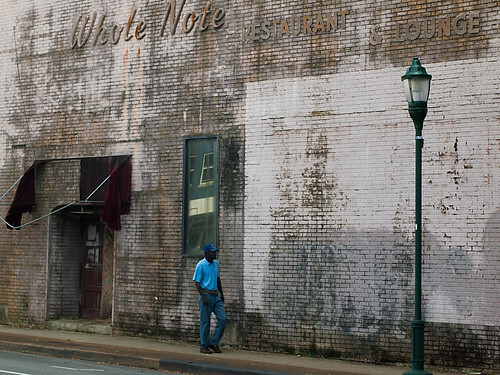 The The Big 9 was once the prime African-American enterprise and entertainment district in Chattanooga, Tennessee. And the Whole Note Restaurant and Lounge was once one of that neighborhood's premier African-American music clubs. Now renamed the Martin Luther King District, the area shows signs of revitalization. In what form remains to be seen. In the photo, taken 6 October 2018, a man walks in front of the now-abandoned club. 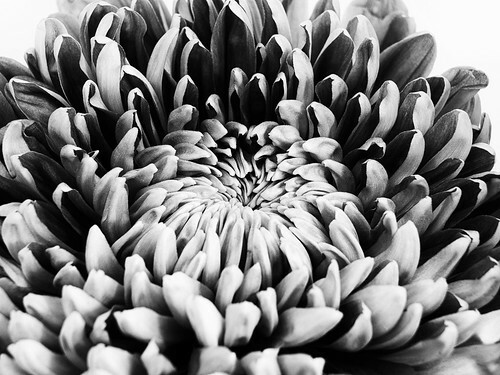 Pic(k) of the Week: Dahlia in black & white. Up close and personal, like an anemone on dry land. 30 September 2018. 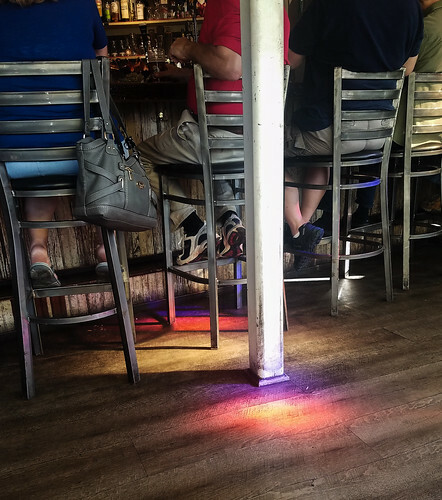 The colors of beer, or, at least, of a pub in the afternoon sun. In Decatur, Georgia, on 22 September 2018 ... in the late afternoon. Autumn begins today in the Northern Hemisphere. On the U.S. East Coast, that'll be at 9:54 tonight. 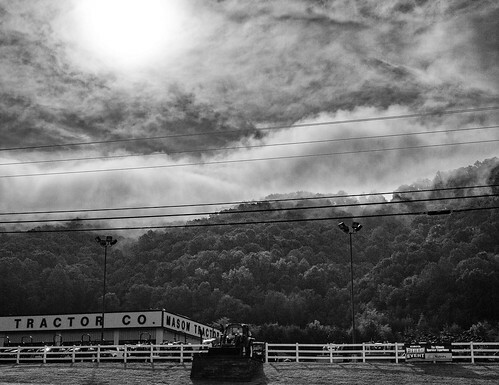 As to the photo: late summer clouds were feeling the changing season, hanging low over the hills in Blue Ridge, Georgia, on 8 September 2018. I took the photo. panning from a moving car...but from the passenger side. Summer ends; autumn begins; winter looms. 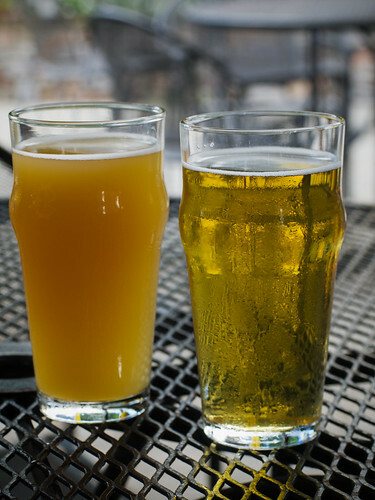 Two draught beers diverged in a pub; and the GABF. With apologies to Robert Frost, but which one did I choose? Either way, on to the news. 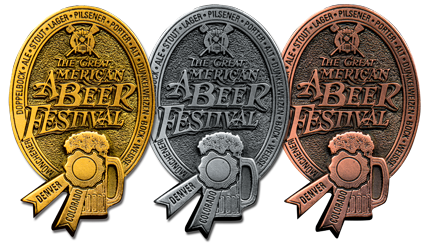 The Great American Beer Festival officially begins tomorrow (Thursday, 20 September 2018) in Denver, Colorado, and continues through Saturday (22 September). The GABF is both a festival and a competition, the latter in which judges putatively select the best beers in America in 102 (!?) 'style' categories. First held in 1982, this is the 37th annual GABF. Murk will be a big winner. Pic(k) of the Week: Summer vegetable grilling. Vegan grilling ... that is, grilling FOR (not OF) vegans. And some beer cookery. Guinness-marinated vegetables, ready for the grill. Corn, ready to be grilled in-husk. Mayo-free potato salad (not for the grill!). For this Labor Day 2018 grill, there were also veggie frankfurters (Field Roast) and veggie burgers (Beyond Meat), both soy-free. Other folk brought fried chicken. Can't win 'em all. Wishing good fortune to all in Hurricane Florence's path. For the rest of us, here are some ways in which we can help. 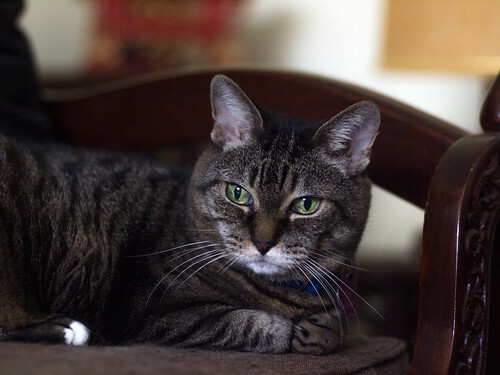 Pic(k) of the Week: Maggie reclines. Not mine, but Maggie agreed to pose for a portrait, nonetheless. Was she, however, delivering an apophasistic gesture with her left paw? Today, don't forget to thank your local brewster! Today, don't forget to thank your local brewster or brewer. 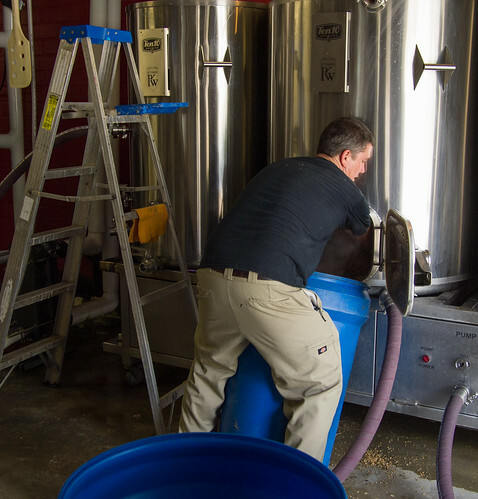 ☞ According to the U.S. Bureau of Labor Statistics, more than 59,000 people work in breweries across the United States. ☞ The [U.S.] Brewers Association —using different methodology— finds 135,072 brewsters and brewers (and brewery and brewpub employees) working at the 6,372 "small and independent" breweries across the country. ... many of whom are working today, Labor Day, to provide your daily beer. Yeast never sleeps. 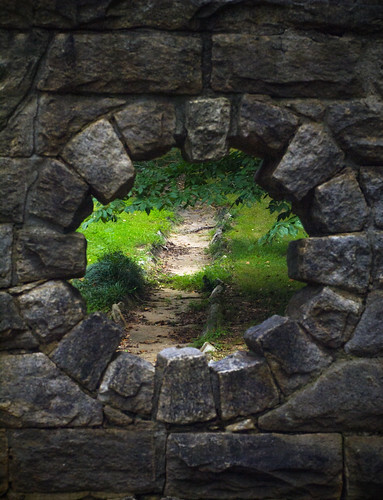 Photo of a 'keyhole' —in a short-span stone bridge built over a usually-dry storm-runoff culvert— in Grant Park, Atlanta, Georgia, taken on 29 August 2018. Grant Park —Atlanta, Georgia's first city-owned public park— was named, not for nemesis Ulysses S. Grant, but Lemuel P. Grant (no relation), an Atlanta businessman who donated over 100 acres of his personal property to Atlanta in 1883. Grant was a railroad engineer who designed the fortifications for Atlanta during the Civil War. In 1903, the Olmsted Brothers (sons of landscape architect Frederick Law Olmsted, who planned New York City's Central Park) were hired to design the park. It included Lake Abana, large enough for boating, since paved over as a parking lot for Zoo Atlanta within the park. The surrounding, eponymous neighborhood had also comprised Grant's estate. His three-story mansion, now headquarters for the Atlanta Preservation Center, is one of only four extant antebellum houses in Atlanta. “Therein lies the joy.” Michael Jackson and the pub. The pub is the place that children's fathers get shouted at by children's others for having dallied in. The pub is a landmark in conversation: something happened outside the Rose and Crown; turn left at the King Charles; park your car 100 yards past the Star and Garter. Pub is a three-letter word serves so many purposes. The pub is the place where there is a wooden trapdoor in the pavement. Sometimes, especially in the mornings, the trapdoor is opened, to receive casks, rolling down the ramp. On such occasions, the pub is a parking-place for boldly-painted trucks, and sometimes, horses pulling drays. (The London brewery of Young's is just one which has retained horse-power. *) The pub is the place where lights shine through translucent glass in the evenings, the doors swing open to exhale noisy conversation and beery smells. the pub is the place where stubble-chinned schoolboys sneak in plain clothes to prove their manliness; anyone can fool around with girls, but only real men drink in pubs. — Michael Jackson. The English Pub: A unique social phenomenon. London: Wm Collins & Sons, 1976. For more than thirty years, British journalist Michael Jackson —affectionately known as The Beer Hunter— was a prolific author of influential books on beer (and whiskey), in which he firmly established the concept of beer type and beer style. It has been eleven years since Mr. Jackson died and four decades since he published The English Pub, his first book. Pubs have changed; the beer industry has changed; beer historiography has changed; mores have changed. 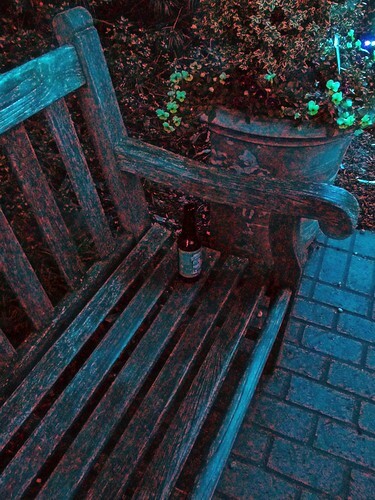 But the Beer Hunter's writing abides. Those who love the institution will continue to investigate it. Because no two pubs are the same (despite the worst efforts of the big brewers), the search can never reach a conclusion. Therein lies the joy. The Avondale Arts Alliance in collaboration with the city of Avondale Estates and the Downtown Development Authority has developed and built a temporary Art Park. 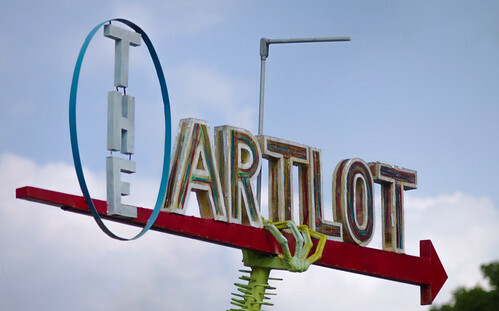 Built on a blighted lot by community volunteers and owned by the City of Avondale Estates, the ArtLot aims to revitalize the downtown area, draw visitors to the downtown district, encourage walkability, and serves as a gathering place for visitors to explore creative experiences. We invite all forms of creative expression at the ArtLot. The photo was taken 21 August 2018. The ArtLot is in Avondale Estates, a propinquitous suburb of Atlanta, Georgia. Sierra Nevada Brewing's Oktoberfest 2018 is a collaboration with Weihenstephan in Freising, Germany, brewed in the U.S. by Sierra Nevada. We’ve partnered with Bavaria’s Weihenstephan, the world’s oldest brewery for this American take on the classic German Oktoberfest. A malt backbone is balanced by subtle hop character in this crisp, clean, and drinkable crowd-pleaser. Nothing captures the spirit of celebration like a beer among friends. Malts: Two-row Pale, Steffi, Pilsner, Munich. Hops (flavor and aroma): Sterling, Spalter, Record. IBUs (international bittering units): 20. From me, here are my reactions. I tasted Oktoberfest, poured from a bottle, in Atlanta, Georgia, on 23 August 2018. 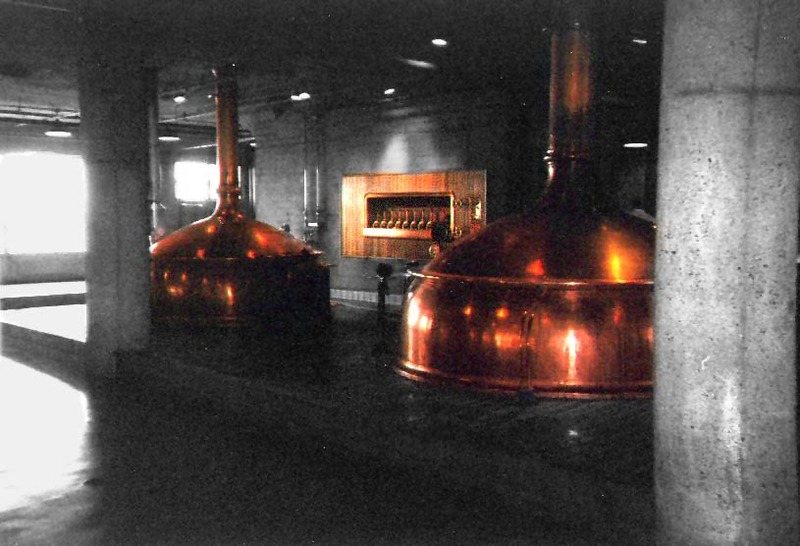 I'm not certain if Sierra Nevada is brewing the lager exclusively at its original plant in Chico, California, or also at its newer brewery in Mills River, North Carolina, but the sample I tasted was brewed at the former. Conditioning: Fine bead, lasting carbonation; long-lived, lightly moussey head. Aroma: Toasted marshmallows in an alfalfa field. Taste: Sweet start with a dry finish. Lightly toasted bread; a good depth of malt. Even a soupçon of 'Meillardy' dark-meat poultry (in a good way). And, here's a kicker. 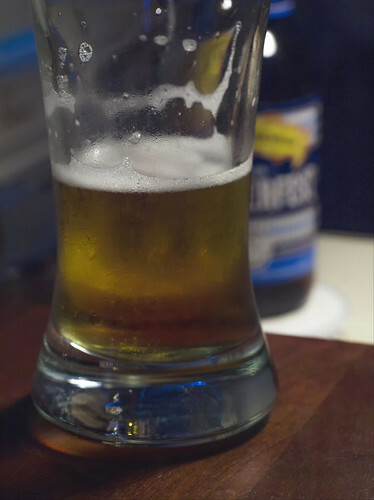 As a neurogastronomical experiment, leave a bit of the beer unfinished in your glass, overnight (if you can). In the morning, smell. Those noble-heritage hops linger on. Glorious! Munich, Germany, begins its Oktoberfest celebrations on Saturday, 22 September, continuing for sixteen days through Sunday, 7 October. I began early. It's reassuring to observe that, despite all, the sun does yet 'rise' in the east in the morning. Documenting the sunrise at St. Augustine Beach, looking east over the Atlantic Ocean, on 5 August 2018, at 6:50 in the morning, Eastern Daylight Time. Sometimes, it's not so much what beer you're drinking, but where you're drinking it. 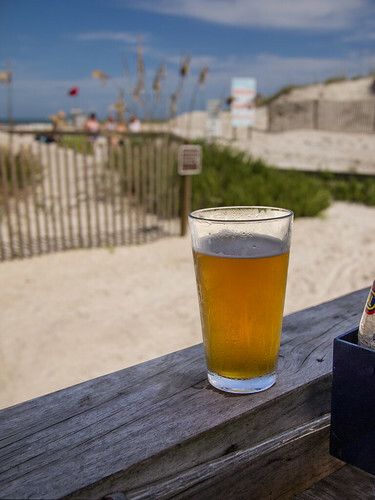 Here: A draft IPA served on the patio of a pub at the beach (and the Atlantic Ocean), in St. Augustine Beach, Florida, on 3 August 2018. Summertime, and the drinking was easy. "Where's the beer?" they've asked of recent Pic(k)s of the Week. Here it is. It's amusing what you can find in a thrift store. 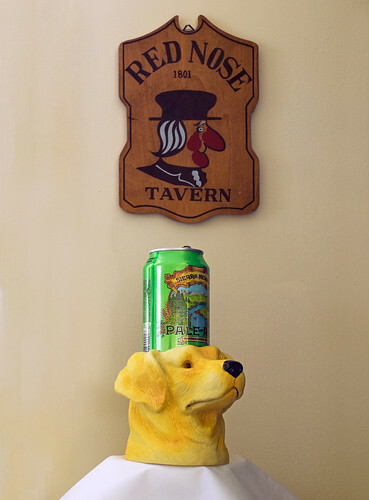 It's even more amusing when you actually purchase it: a Labrador Retriever beer koozie ... on a pedestal. At the Red Nose Tavern, somewhere in Atlanta, Georgia, on 26 July 2018. 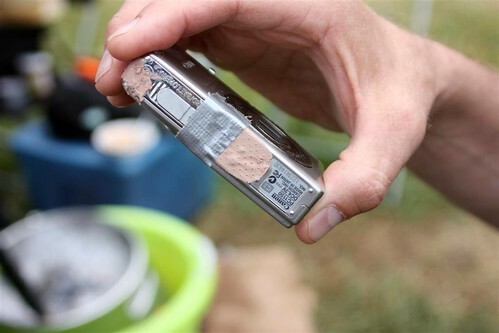 In 2009, this was the state of the photography, here, at YFGF: a Canon PowerShot SD400 point-and-shoot held together with —if not spit and baling wire— band-aids and duct tape. 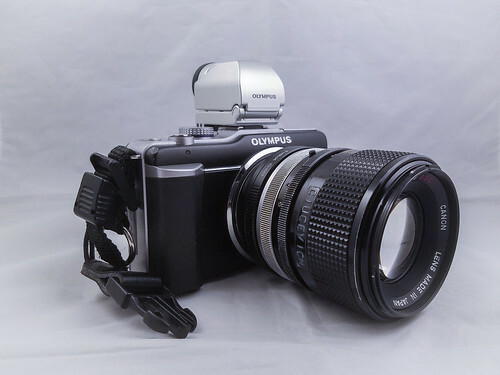 In 2018, this: a seven-year-old Olympus Pen E-PL1 with a thirty-seven-year-old lens. The gear has changed. But the technique?